I think Mike and I both knew from an early age that the farm life was for us. Ironically, we both grew up within 5 miles of each other in the suburbs of Pittsburgh. Despite our suburbia up bringing, we both prepared for our destiny. I went on to complete a degree in Animal Science from the School of Agriculture at Michigan State University while Mike went off to Oklahoma to become a Certified Farrier. Several years later our paths crossed and it soon became clear that we had each found the partner we were looking for to go Country! 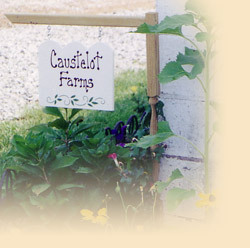 After months of unsuccessful searching we finally found what we affectionately refer to as Caustelot Farms in November of 1999. At the time my only concern was transforming our 100+ year old dilapidated cow farm into a home that would be suitable for our six horses. I had no idea my husband’s ideas were so grand! We encountered our first disagreement when I insisted on saving our historic barn that Mike would have preferred to level. Thankfully we met an Amish man from New Wilmington who gave us hope that the structure could be saved. So the Amish man and his crew went to work. You can imagine my surprise when I came home from my day job to find the entire barn jacked up in the air so the foundation could be replaced. Yikes! In any case, our photo gallery gives a glimpse of this project as well as some of the other projects we have tackled over the past five years at Caustelot. As you can see this has been a labor of love that has only made us appreciate our new life in the country all the more. If you are ever in our neck of the woods we invite you to come visit us!